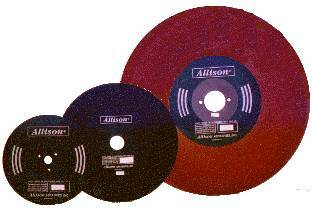 Economiserâ„¢ multi-purpose cut-off wheels were specially developed by Allison for fast, clean and economical cutting action. They are available in diameters from 1" through 26", for wet and dry cutting applications. Your Allison distributor has them on the shelf for immediate delivery. Reinforced Economiser wheels are recommended for most dry cutting applications, especially those where side pressure on the cutting wheel is a factor. Always use reinforced wheels for foundry cut-off operations. Non-reinforced Economiser wheels provide faster, cleaner cuts and lower costs per cut. They should be used only on well-guarded machines and the material being cut should be securely clamped. We have been a premier manufacturer of cut-off wheels since 1919. The Fast CutÂ® lines are designed for providing fast, clean, efficient cutting at an economical value. The Fast CutÂ® wheel provides excellent fast cutting on a wide range of metal and alloyed steels. The Z style is a is faster and more aggressive cut using premium zirconia grain. The HD line are larger heavy duty wheels for large applications. All are designed for high speed stationary chop saw applications. The Fast CutÂ® R line are high speed blades for metal and alloyed steels in any configuration including rail. They perform excellent in fixed cutting gas and hydraulic saws. For product specs, please see pages 16-18 of the Allison Abrasives brochure. Wet abrasive cutting provides the finest quality cuts on large cross-sections of specialty steels and titanium alloys. 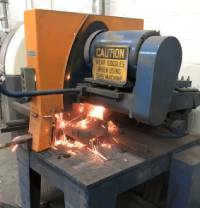 These wheels are used for cutting billets, bars, pipe, or plate. Available in 762mm (30") to 1700mm (67â€�) diameters, with varying levels of reinforcing to reduce the possibility of wheel breakage. Most of these wheels are available without reinforcing, with â€œhubsâ€� (partial diameter external reinforcing) or with full diameter external reinforcing. When ordering, identify wheel specifications, diameter, thickness, arbor hole size and location of any required drive pin holes. Also identify size and position of reinforcing desired. For product specs, please see pages 10-11 of the Allison Abrasives brochure. The recent introduction of high-performance, free-cutting abrasives, coupled with new resin-bonding systems, has resulted in wheels specifically designed to cut these materials, dry, at low cost, while maintaining excellent material quality of cut. Wheels are available in diameters up to 67" (1700mm), with varying levels of reinforcing to reduce the possibility of wheel breakage. Most of our titanium cutoff wheels are available without reinforcing, with â€œhubsâ€� (partial diameter external reinforcing) or with full diameter external reinforcing. When ordering, identify wheel specifications, diameter, thickness, arbor hole size and location of any required drive pin holes. Also identify size and position of reinforcing desired.